I have noticed that the sound post in my violin is not vertical. It is not off vertical by much but is noticeable (~1/8 inch). Will that matter much or is it within the tolerances of violins ? In an ideal universe it should be perfectly vertical, supposedly we find a norm to define the "horizontal plane" first. Was it once straight and suddenly you noticed it was moved? A great tool to use if you don't have a sound post adjuster is a fork. Tap one side in the direction it needs to go with strong but short decisive strokes. Observe the amount of movement between all your strokes. Mostly I am asking out of curiosity. I'm not sure if the sound post was perfectly straight before but it is at a silght angle relative to the bridge and the bridge is at a right angle relative to the top plate. As far as I can tell the violin sounds fine and I can tune it without problems. I'll see if I can get some pictures of the sound post. Also it is good to know that visiting a luthier is an option as I am new to this world things concerning violins. My guess is that there is no problem with it. I think it would be fun to get an inexpensive violin and play with sound post adjusting before I try anything on this instrument. Thanks again Hermes and Fiddlerman! Here are a couple of pictured of the sound post. Probably not a big deal but wanted to know what y'all think. I see what you mean by not straight. As an experiment I would move the bridge back so that it is not perfectly aligned with the notches on the f holes; move it back just far enough so that the bottom right foot is covering a bit of the sound post surface area. Then test to see if you like the sound. my logic behind this is perhaps the shape of the sound post is in fact making full contact with the top and back of the fiddle albeit slanted. By adjusting the bridge you can improve the violin. or you'll completely knock down the sound post, but if your taking it to a luthier/violin repair man a fallen sound post is already an inevitable incident. Questions : has it always been like that? is it a nice violin? idealistic rhetoric : is it possible that a proper slanted sound post is a luthieric form on innovation? Chrisramo3 Thank you for your pic update. It seems as if there is indeed a small tilt, if the tailpiece side of your bridge is perpendicular to the top plate as you mentioned. Is it straight the other way round? (sight down the violin from the fingerboard to the tailpiece and look through the treble f hole). If so, where is it relatively to the foot of the bridge? is it aligned with it? It may sound ok, but I am sure it will sound better if placed vertically. However since the angle is small, maybe it would be better to leave the operation to a luthier if possible. If you haven't done this before, mind that it could take longer time to do it than the luthier and Fiddlerman do in the video, and even longer to place it straight 🙂 I am not even discouraging you, it's just something to consider : maybe going diy would be longer than the trip to the luthier if it's the first time. Of course you can practice on a spare instrument as you said before. Truthfully you need to show more of the top plate for us to really see if it's tilted. I know many of you think it looks crooked but one easily gets fooled by the various angels and curves. From what I am seeing it is very possible that the top of the sound-post should be moved towards the bridge, or the bottom away from the bridge. @Fiddlerman , @Hermes, and @Jacques - Thanks again for all the great advice. I have tried to take some better pictures and made a comparison with my other violin. Since the difference is so slight I think I will take it to a local luthier and ask the same question. It is probably just in need of a slight adjustment if it needs one at all. I think will order a violin kit and work on putting one together ( if I do I'll post that in the forum) but I believe I will leave this issue to the pros. These pictures are obviously better but not what I need to see. What I would need to see is first that the bridge is perpendicular to the top plate. The top plate in relation to the top of the ribs. So a picture from the side facing the ribs. If the bridge is 100% straight (for use as a guideline only) you can then take the angled picture looking into the violin with the sound-post in sight such as what you did. For now, the sound-post appears to be angled very slightly with the top further back than the bottom in relation to the bridge. Here are some additional pics. I hope this is the angle you were looking for. Not quite though it might work for you. I look at the top plate from the top edge of the ribs and make sure that the bridge is perfectly straight for use as a guide. Then I turn it so that I can see the bridge and sound post from an angle looking down. I want them to be on the same angle. Using your picture this is what I would look at. Then the sound-post after setting the bridge straight. 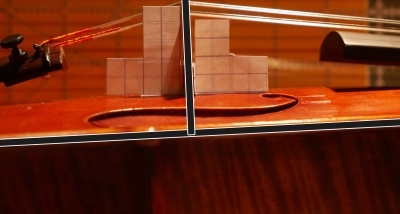 @Fiddlerman - Thanks for pointing out the bridge position relative to the edge of the violin. I looked at the bridge very closely and it looks like it was tilted forward by a tiny bit. I straightened out the bridge so the back of the bridge was at right angles to the edge of the violin (corresponding to the horizontal line you drew) and the deep resonances came back immediately. The violin body was barely resonating before and it sounded ok but not great. Now when I bow across the strings I get the powerful resonances over the top and bottom plate. They sound deep and haunting (maybe poignant is a better word). Music to my ears. 🙂 Good job.